Author Patricia Nichvolodoff encourages positive family relationships and critical thinking in new children’s book. I encourage grandparents to read the story with their grandchildren to strengthen their bond. There’s no place like home… Except Grandpa’s. 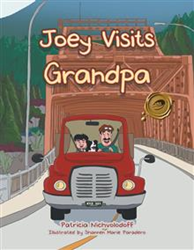 In “Joey Visits Grandpa,” author Patricia Nichvolodoff tells a humorous and heart-warming story about the special relationship between Joey and his grandfather. After his grandfather continuously misplaces his glasses, Joey devises a creative plan to solve his grandfather’s problem. Just as the initial problem is solved, the story ends with a new problem, revealing a humorous conundrum left for young readers to solve on their own. Inspired by her own relationship with her father, Nichvolodoff hopes to remind parents of the powerful influence of loving relationships on a child’s development, encourage children to utilize their problem-solving skills and develop a child’s love for literature. For more information, visit http://www.patricianichvolodoff.com. Patricia Nichvolodoff is a teacher and children’s book author who lives with her husband and family in British Columbia. She has previously published “Cleo’s Treasure Hunt” and “Sophia’s Red Hat,” and is currently writing children’s books “Joey Helps Grandma” and “Cleo in the Castle,” as well as a junior novel series for children ages 9-14.